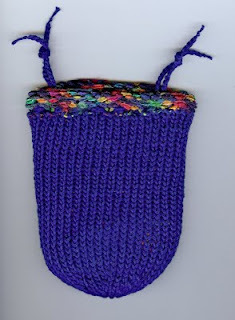 This is the latest dice bag I’ve made for my Hubby. The outer layer is made of OnLine Linie 14 Trend Collection “Cedro” color 0108 (a narrow ribbon yarn with some silvery highlights that you can't see in the scan) using size 8 dpns; the liner is Omega Sinfonia Azul Rey color 833 (a sportweight yarn) using size 3 dpns. After knitting the outer part of the bag, I flip the bag inside-out, calculate the difference in number of stitches to get the same circumference, then pick up and knit so that the wrong sides will face each other, making sure to leave enough depth at the top for the bag to gather when the ties are inserted. 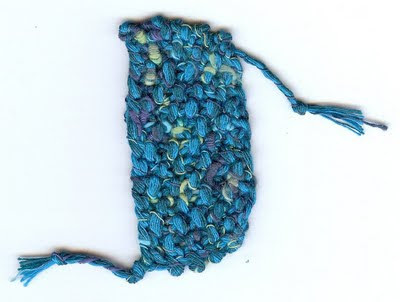 The ties are made from the same yarn as the liner, and are simply two strands of crocheted chain stitch. You might wonder why a bag intended for 7 one-inch plastic dice would need a liner, since the dice are too big to fall out through the stitches. While the liner is technically not necessary, there are several reasons a liner is desirable. The most practical reason is that it ensures the 4-sided dice (the pointiest of the set; essentially a tiny pyramid) don’t poke through. The added thickness also helps insulate the dice when (not if) the bag gets dropped. Both liner and outer layer stretch, so they can hold a lot of dice. This is important because we’re avid dice collectors, so rarely is there only one set in a bag. The extra layer also gives the bag a more luxurious feel, which can make a difference if you’re in mid-game battle, worried for your character, clutching your dice bag like your character's life depends on it, hoping the dice inside won’t fail you. You can buy a thin, flimsy dice bag anywhere, but for the “lucky dice,” only the best will do. 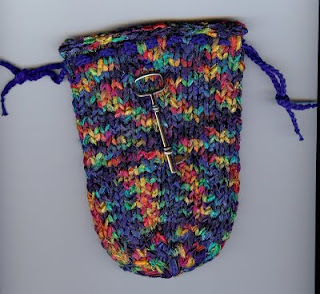 I was working on a post about different knitting styles, and my journey in figuring out that there were different knitting styles, when I discovered that the kind folks at Knitting Daily had just posted one on that exact subject. Perhaps I should give a bit of history on why I would post about such a subject in the first place. Originally, I learned to knit from the Better Homes and Gardens website around 9 years ago because I had a little book on knitted afghans and wanted to make one. After finding the BHG site, it took me an hour to understand and successfully use the cast-on (the thumb cast-on, which is still the one I use). When I got to the instructions for the knit and purl stitches, it was even more difficult, largely because they show the yarn in the right hand. Having learned to crochet as a child, I couldn't help but hold the yarn in my left hand. Nonetheless, I managed to teach myself well enough to make a striped afghan and eventually a decent sweater, and I've been knitting ever since. Naturally, my knitting has evolved over the last 9 years as I've learned new techniques and corrected old ones. Case in point, it took a couple of years and the use of someone's knitting machine for me to notice that the stitches in every other row of my knitting were twisted on everything I'd ever knitted. Astonished at my own lack of technique, I figured out on my own how to compensate, at first by turning the stitches before knitting them, which made knitting take twice as long, and then by knitting into the back of the stitch. Ultimately, I trained myself to wrap the yarn the other way on my knitted rows, which is still what I do. Meanwhile, however, I was determined to find some written explanation somewhere that would tell me I wasn't simply knitting wrong. I flipped through countless books, hoping for an answer, but found only tiny pictures of perfect hands gracefully holding needles, yarn faithfully trailing off to the right. These looked nothing like the crazy wrap-around thing I have always done with my left hand to keep proper tension. 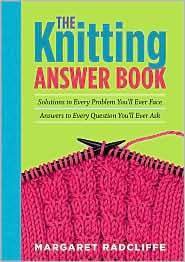 Finally, I found a book I've mentioned before, "The Knitting Answer Book," by Margaret Radcliffe. In it, she discusses the English-American vs. Continental-Germanic methods. At last, I felt vindicated in my knitting style and method of compensating. I found that book a couple of years ago, and since then, it seems to me the various knitting styles are appearing in more and more publications, such as the above blog from Knitting Daily, in which the English-American method is also referred to as Throwing and the Continental-Germanic method is also called Picking. It turns out, my particular style looks very much like the last picture (Anna-Liza) in the Knitting Daily blog, with the occasional addition of wrapping the yarn around my left pinkie if the yarn is particularly slippery. I have even read of folks who have trained themselves to knit using both styles at the same time, apparently because it helps in dealing with multiple balls of yarn at once. While my research on the subject was purely selfish, the discovery of varying knitting styles recently helped me teach someone to knit. A few weeks ago, a couple of friends came over, mostly to hang out and also so I could give one of them that long-awaited knitting lesson. She had apparently learned to crochet long ago, so I tried to show her how I do it, i.e., the Germanic method, but it just didn't seem to work for her. The yarn seemed intent on going anywhere except where she wanted it to. Finally, I noticed she kept unconsciously putting the yarn in her right hand, so my mental light bulb went on and I showed her how to use the English method. She picked it right up and got her gauge even before we were done with her test swatch. I had never successfully held the yarn in my right hand before, but in showing her, I managed it that evening. Had I not already done the research, we probably both would have given up on it. Instead, she went home with a fairly decent project started. Of course, it still seems foreign to my hands to knit using the English method, but at least I can do it well enough to show someone else. I guess the point is, if you manage to create the proper stitches and remember to compensate for any twisting, no knitting style can be said to be "wrong," as long as it's working for you. Arrgghh, matey, would ya be wantin' to knit and purl? this is because I have a different gauge in knitting vs. purling. I was actually aware that I purl much more tightly than I knit, but I didn't do the mental math on the effect it would have on my circular gauge until I had to re-do a pair of socks for my hubby 3 times before getting it right. 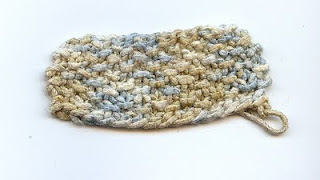 I've changed to doing test swatches in seed stitch so as to even it out, and that gets pretty close, generally within a quarter of a stitch per inch. 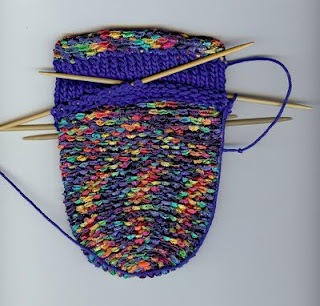 Of course, if the intended recipient is handy, I've just been making socks toe-up and trying them on, with the increases stopping once the right circumference is reached. Unfortunately, the intended recipient is not always handy, so Ms. Radcliffe suggests an alternative method: sliding the stitches back down the double-pointed needle and just wrapping the yarn loosely behind the swatch, thus knitting all rows without creating a garter stitch. I'll have to try that. I highly recommend this book, by the way. There are questions I've had about knitting that I could not get answered anywhere else, including what turned out to be different knitting styles, but that's a matter for another post. It's for a port city-based campaign, and the intent of the outer color is to approximate the color of the sea. The inner color has sky and sand hues and the two create yarns an interesting combination. The bag isn't finished yet, but pics will be uploaded once it is. 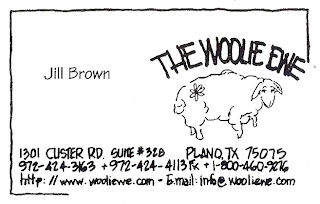 They're very knowledgeable about yarn and all things yarn-related, and very nice people. They have a great selection of really beautiful yarns. I am fortunate that they're not closer to my house, or I'd be bankrupt.